Cherry and Spoon: Fringe Festival 2016: "Broken English, Mother Tongue." Fringe Festival 2016: "Broken English, Mother Tongue." Title: Broken English, Mother Tongue. Summary: A one-man show about growing up in Puerto Rico and US Army bases around the world. Highlights: I'll admit it, most of what I know about Puerto Rico is from West Side Story, and more recently that piece that John Oliver did. So this show was interesting and educational for me (but in a fun way, with quiz questions and Ricky Martin videos). But more than that, it's a well-told and very personal story of one person's life experience. 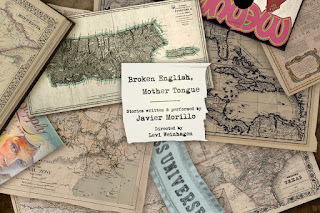 Javier Morillo talks about growing up on U.S. Army bases in Puerto Rico and elsewhere, receiving a sort of Americanized education that didn't fully prepare him for moving to America for college. He talks about his mother's illness, his conflicted relationship with his tough soldier father, and the complicated relationship between Puerto Rico and the U.S. They say that the more specific something is, the more universal it is, and this show is a perfect example of this. Javier's very specific details of his life story encompass universal themes of family, childhood, and identity. Broken English, Mother Tongue. is funny, poignant, and entertaining. I'll leave you with this quote: "Puerto Rico wouldn't be Puerto Rico without the United States, but the reverse is also true."